Chickpeas combine with nutbutter (peanut butter, almond butter and sun butter all work here!) 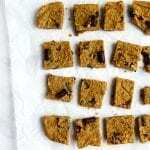 to make one of my new favorite sweet treats…Chickpea Walnut Blondies! Preheat the oven to 350 ̊F. Spray an 8-inch square pan with oil or nonstick spray. Place all ingredients except the chocolate chips and walnuts in a food processor or high-powered blender and blend until smooth. Fold the chocolate chips and walnuts into the thick batter. Bake the batter in the prepared baking pan for 25-30 minutes or until the edges are set. You can allow the blondies to cool, or dig in while warm and gooey! Cut into 16 bars and enjoy. *You can sub Sunbutter and omit the walnuts if you are preparing for someone with a nut allergy. The ingredients in this recipe are in compliance with the Monash University App, but this recipe has not been tested for FODMAP content.